During May and June 2011 patients and carers were asked to provide ADHB with feedback about their current experience of the Greenlane Surgical Unit, ward and Ophthalmology day stay. The things they said are helping us plan changes to some of our processes and the physical environment. 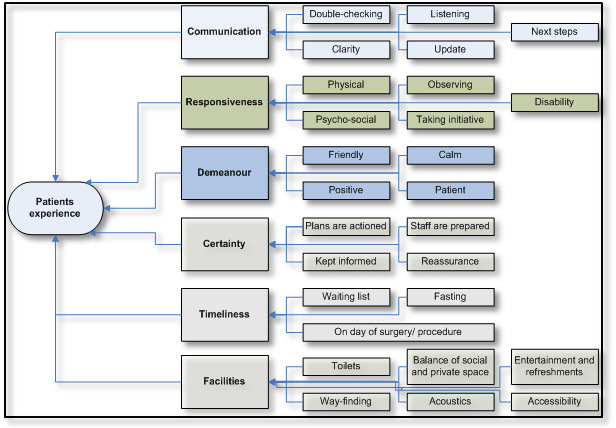 The scope of the patient & carer feedback was for day of surgery, from check-in to discharge. Patient feedback was via a survey and a focus group. The results of the patient survey were presented to the patients attending the focus group. This was to assist with gaining a more in-depth understanding of the survey feedback and for the patients attending the focus group to provide in-depth details of their specific experience, should they choose to. Collecting this information was an important step in the development of patient flow and process change/development for the project. The 240 patients that responded to the study told us how they felt at various stages on their journey through the services and the reasons why they felt that way. The patients were at the Greenlane Surgical Unit for a wide rage of reasons but many of them told us the same thing. They told us that, overall, the things that had the biggest impact on their experience were communication with staff, the responsiveness of staff, staff demeanour, certainty about their care, and the timeliness of their care. When we did well at these things, patients tended to have a positive experience. When we didn't do well in these areas, patients tended to have a negative experience. The patients also told us that facilities were important and that we should make improvements to them. However, few patients said that the facilities were the main reason why they had a good or poor experience while at Greenlane. We heard from the patients that it was making improvements at check-in and waiting to be prepared for their procedure that could make the biggest difference to patients. We also heard that by far the majority of our staff are doing an excellent job. We are pleased to hear that. However, we also heard that we could do better with keeping patients informed about both their procedure and how they are likely to have to wait. We will endeavour to do that. Some changes to the facility itself would also help, such as signage. Changes will be communicated with our patients as they happen to make sure your experience with us is a good one. Auckland District Health Board would like to thank all patients who provided us with information through the survey and the focus group.